Latest post Thu, Nov 15 2018 4:21 PM by dew. 20 replies. At my video club here in Cleveland Ohio a member is not re-subscribing to his MC subscription and will be using Adobe Premiere. The only reason I could use to suggest staying with MC is the ability to edit with other team members however most editors in the club are solo and do more simple wedding/business factory/conventions they don't seem to involve themselves with all the possibilities of Avid NLE. Yes even these techno videos could benefit from extensive abilities but these editors don't spend the time learning and solving problems. Their clients are satisfied with basic editing and final product. Got me thinking I pay $600 for the master suite of software which includes Premier, I would also be able to fluently go out of MC into AE, I can go into audition to repair audio, Encoder (sorenson is hard to learn). Maybe it's time to leave Avid? What are the benefits for a solo editor to stay with Avid? one is simple, the other complex. one is optimized for making features easily accessible, the other aims to provide the right feature at the right moment. one makes up labels for buttons by coin-toss, the other trys to adhere to indysty wide nomenclature. one can't open project from 3 years back, the other can go back 20 years back as well as go up & down in versions. if you're assets are of any value, the choice is clear. if minor monetary concerns play into you're decision making, you're not the target audience. every time i get a projects for mastering from somebody premiere, there are severe problems that produce sigificant cost. be it color levels or interlacing. every time. every time i've got a director over from any adobe or fcp-x facility jaws hit the floor at the insane speed at which avid + operator perform. i've been with adobe, there is no way in hell i'm ever going back. i'd rather go into color correction, quality control or become a director or anything else sufficiently complex, rather than deal with the technical retardation that is premiere. but yes, it's not hobbyist software. I remain with Avid solely because of the Fluid Morph effect. I do alot of talking-head inerviews, and this effect works magic for me. But there are literally dozens of things Premiere does better than Media Composer, and it occasionally adds USEFUL improvements. The myth that Avid is better for pro editors (and Premiere is for hobbyists) is merely an ad-hominem argument and not logically sound. As you noted, If you need sharp looking graphics, compositing, high quality visual effects, pro audio editing, modern color correction, etc. then you are better off with Premiere- that tightly integrates with After Effects and other, better, Adobe tools. Try to sub-frame edit audio, or get your graphics to look great with Media Composer. You simply get inferior results. The effects structure in Avid is laughably bad, and there's no indication it will ever get better. If you use the Fluid Morph effect, Avid is amazing. I also prefer the way MC handles transitions. But for the last decade or more, Avid has been crippled by its managment - that seemingly does not understand editing at all. At. All. Adobe seems to be run by folks who let editors have some say in software development. I would literally be shocked if anyone in Avid's senior management could tell you what sub-frame audio editing is. Or blending modes. Unless you have very specific needs for certain Media Composer items, Premiere wins hands down in every pro feature category. I'm much faster on Avid, but I've been using it for 20+ years. 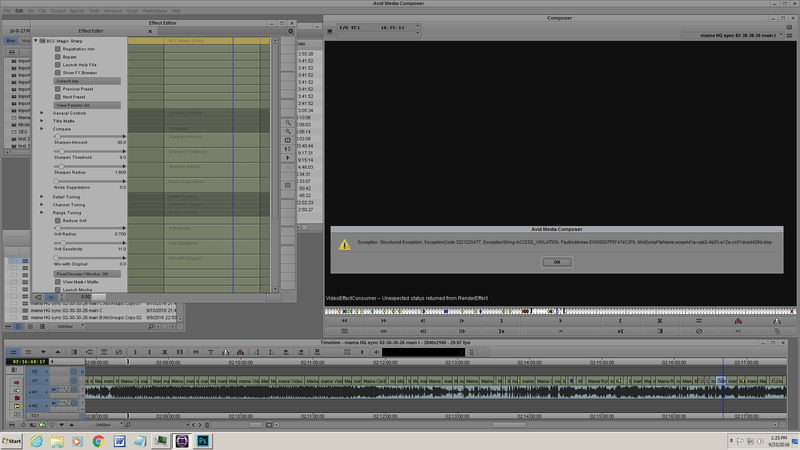 After that amount of time on Premiere, I have no doubt I could edit on that platform just as quickly. My Car is better than Yours ..
As for the original question, use whichever one makes you happy. Each of us has different reasons for liking whichever software we edit with, and my reasons are different from yours, Lukas', Mike's, Philip's, and Tomas'. Decide for yourself. Thanks everyone for the ideas, I stay with Media composer because I have a lot invested in Plug-ins and learning the curve. I hope to have skills I can use in the future when I edit in bigger enviroments. I will take this back and continue to promote Avid to the club members here in Cleveland. I do know Cuyahoga Community College has switched to Avid and Cleveland State University uses Avid but these young editors leaving college and purchasing the master Adobe suite at the same price as Avid; they are going to ask the same question. When Media Composer First comes out might be a big boost. Interesting thread. I've been using Avid since about 1992, but in the last 9 months I have sort-off moved on to Premier. I had two MC licenses and have dropped one. I'm seriously thinking of dropping the other. When choosing what system to use for a job, I find myself using MC less and less these days and perfering the speed and flexability that PP offers. It's so much faster and more intuitive in the timeline. Sure there's things I don't like - but not a lot, no deal breakers. I love the integration with After Effects and find sound mixing a lot easier than MC. I never thought I would make the change but MC just seems so much drama these days, quite dated in it's layout, interface and it just feels clunky. The new version is painfully slow on my 2017 iMac and crashes a lot. I've gotten to understand how PP operates, I've deleloped a file menu structure that works well, so media isn't an issue. It just feels more modern. I hpe you stick around for a little longer as there is a bunch of new things coming in the next 2-6 months that I feel will surprise the masses. Agree that the UI is a tad long in the tooth but we are working on that so dont leave us yet. I don't get it, both MC and PP have a timeline, a source and a record monitor, and their own flavours of bins. What is the interface difference? Both NLEs have their strengths and weaknesses, choose whatever suits You better, no need to start a flame here. I've had to recut a feature started on PP by another editor, and it has been a media management hell, often starting the system in the morning would result in a media offline to reconnect error message, whereas no media were actually being moved around in the storage, the tool simply is not fit for anything over 15 minutes; it sure ingests everything including the kitchen sink, but not that well, while MC might not be a swiss army knife, but whatever it does is well done (except for FrameFlex, to be fully honest!). Not to mention the crashes, quite frequent when trimming, while I seldom see MC crashing, even on my unsupported systems. And I would not trade MC's projects compatibility across versions for the Adobe uncompatible way. Sure there is room for improvements for both MC and Premiere, but as of now I find MC more mature and reliable, Premiere still has to reach this stage. Where they will both go, time will tell, for the time being I do not see Premiere as a valid alternative. I trust Premiere to improve (and so will MC), but as of now I stick to MC. Time for renewal and I again write to support lamenting on all the time we spent trying to get my computer working with MC, full screen problems and weird errors like the one attached. I just can't spend any more time with support or buy a special dedicated work station just for AVID. Premiere offered fast AMA linking whereas linking just does not work with Avid as Bruce Douglas had mentioned when he quit and went to Edius. I just didn't believe him but he was right. I hung out as long as I could but all editors in my club here in Cleveland don't use Avid and I have to relinquish my stubborn addiction to MC. My college (Tri-C Cleveland) finally got MC on the computers in the lab and when I went back to take a class I was disappoint only a few of the professors were able to get certified but the reality is would the students learn and do well on MC? The professors could not take the time to teach the students as they learn faster on Premiere from all the training content available but also their friends use Premiere. So MC just sits there in the lab as an antique NLE that editors in Hollywood most used when it was at the top of it’s game. You need experienced Avid users teaching MC to students. I use and teach Avid in Broadcast and Commercial Post houses. And when I do teach in Uni a lot of Adobe users are surprised to see how quick and effcient an experienced Avid can be compared to the same workflow in Adobe. care to elaborate on your biggest selling points? I don't use Avid as much as I used to, but the product is battle hardened and tested in some of the most demanding post situations out there. It just works, which is why Hollywood, news, long-form broadcast all are dominated by Avid products. They just work. To me, trust in the product "showing up on game day" is the biggest selling point you can have.